2013’s been a great year for travel adventures. I went on my first-ever cruise around the Mediterranean, visiting Italy, Sicily, Greece and Turkey; spent three weeks in Spain at La Manga and jetted off to Thailand for an autumn break. And of course there’s also my winter sojourn in Cape Town. So that’s a lot of different cuisines to explore. Choosing 10 dishes wasn’t easy, I’ve eaten so much good food this year. Possibly my most over-used words of the year are “the best ever”, got to be a sign of a good year! Here are 10 delectable dishes for you to delight in. The restaurants in Cape Town are truly wonderful and plentiful. I’ve chosen dishes from four of my favourites – one of which, sadly, closed at the end of November. First up is Bistro Sixteen82 which is set in the Steenberg Wine Estate at the foothills of the Steenberg Mountains. It’s named after the year Steenberg was established and is a lovely modern space with beautiful views and a genius chef. I’ve been to Sixteen82 many, many times and plan to go many more. 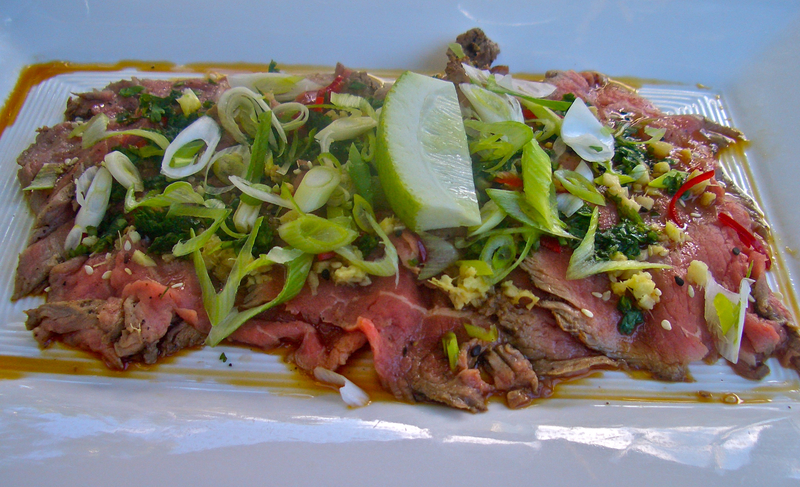 The biggest challenge for me always used to be not to order the beef tataki every time – it’s just the perfect lunchtime dish. Amazingly tender meat, light and rare with a fabulous dressing. And it looks so beautiful, too. Sadly, it’s no longer on their menu which will force me to be a bit more adventurous with future choices. Gotta look at the positive side. Some of the best food in Cape Town, and at remarkable value is at La Mouette in Sea Point. Another genius chef who produces a wonderful seasonal tasting menu that changes regularly. Pick a warm, wind-free night and sit in their lovely courtyard next to the fountain – the situation and the food are just heavenly. 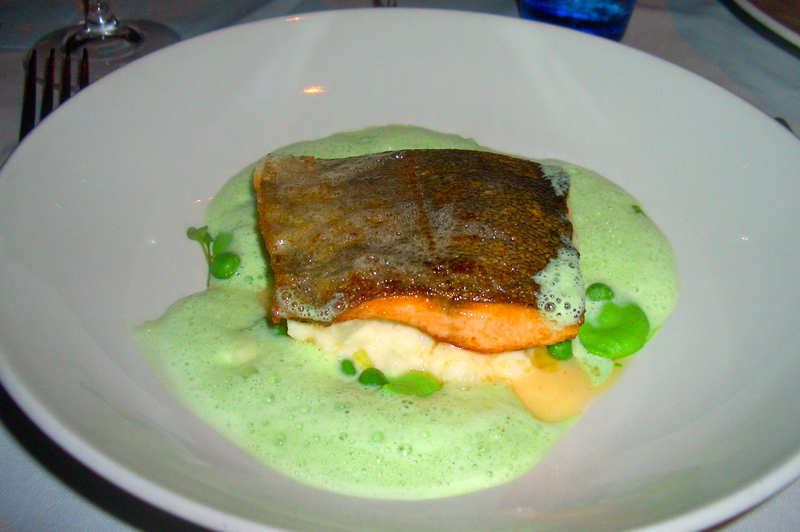 I had this fantastically tasty and pretty main course of Franschhoek trout fillet with lightly smoked potato salad, pea puree and mint. I limited myself to my top-10 dishes in this post, but feel the La Mouette signature dish has to get a mention – their truffle croquettes are sublime and always elicit gasps of delight. Bistrot Biserca is also another favourite. Recently relocated to Heritage Square in the centre of Cape Town, it’s run by a husband and wife team and the menu has a strong French influence. There are just six dishes permanently on the menu and then there’s the daily blackboard menu. Seasonal ingredients have a big influence on dishes. 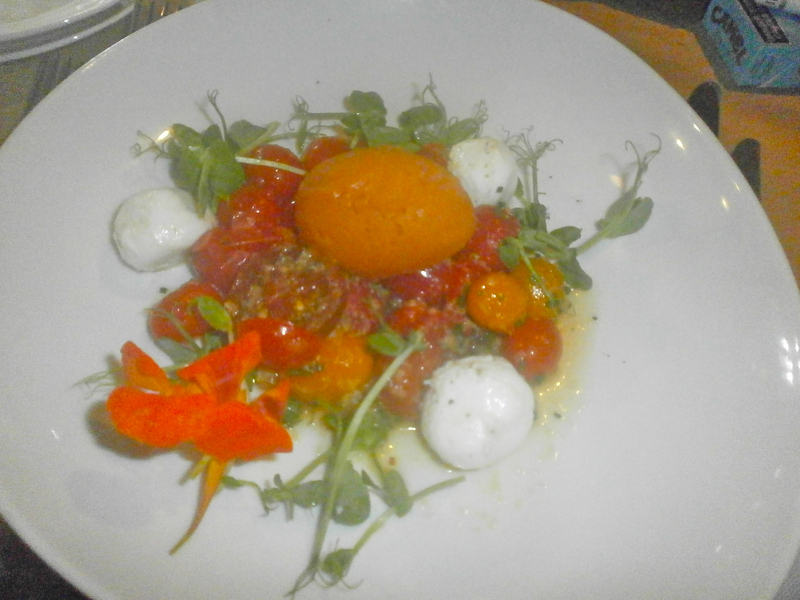 This was my starter: Organic tomato salad, marinated bocconcino, gazpacho sorbet and ginger dressing. Quite simply tomato heaven with heaps of tomatoes, both raw and cooked, velvety soft cheese, a tomato sorbet and wonderfully zesty dressing. My next dish comes from the now (sadly) closed Constantia Uitsig. I spent my birthday lunch there this year on a perfect, sunny day, sitting in the garden overlooking the vineyards. My fish carpaccio starter was spectacular, with an Asian-style dressing and a little mound of sushi rice to mop up all the delicious flavours. We managed to pay one final visit before our old favourite was taken away from us and recently dined at Uitsig on the last night it was open. A bittersweet experience – the food was as stunning as ever. I do have some Spanish genes in the mix (hence my name) and love visiting the country of my forefathers. The Murcia region produces amazing ingredients which makes eating out (and cooking) there a delight. 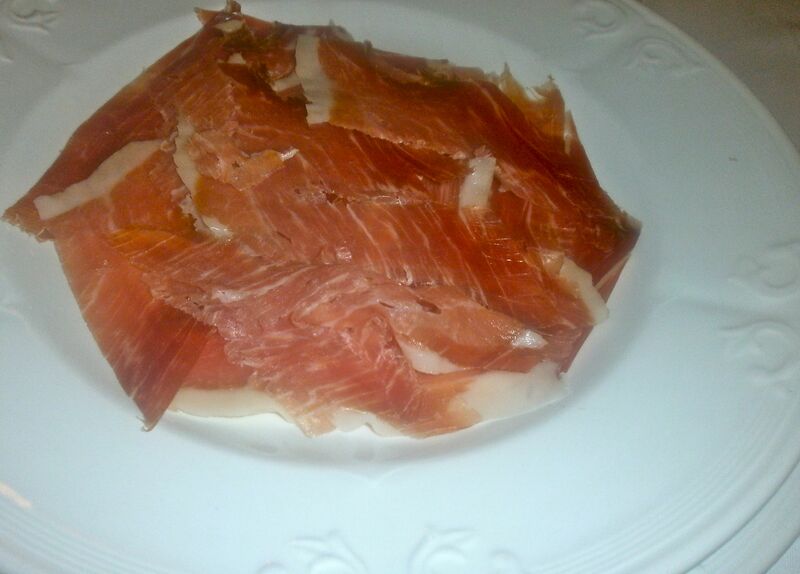 The Spanish certainly know how to raise pigs as well as cure and cook them. From the melt-in-the-mouth jamons, to juicy tasty pork chops, you’re sure to tuck into the tastiest plate of meat you’ll find. At Maribel on the La Manga estate I enjoyed the most perfect plate of lusciously sweet and soft jamon, freshly carved in front of me. A simple dish that I don’t think can be beaten. Arguably the best restaurant in the Murcia region is Jose Maria Los Churrascos in the little town of El Algar. It’s been open for over 30 years and serves “classic cuisine adapted slowly to the new times with imagination” to quote from their website. 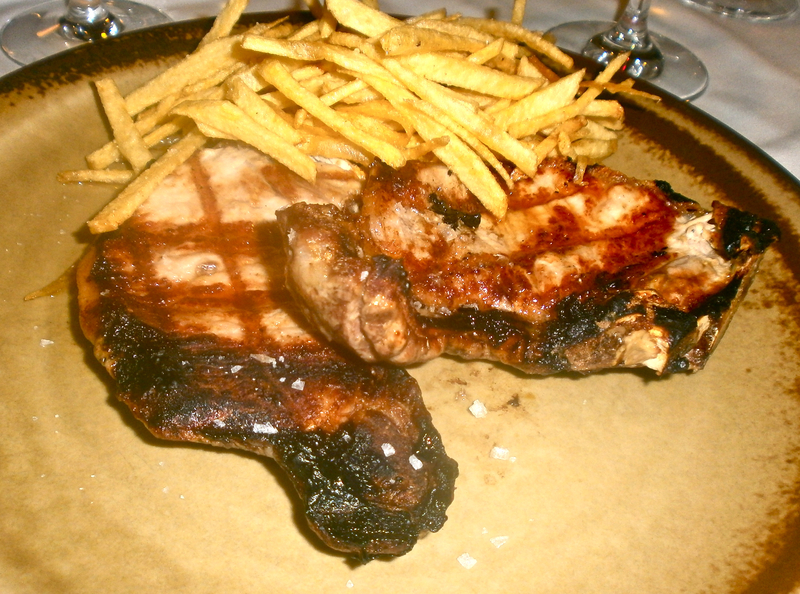 The stunning simplicity of griddled, tender, local pork chops served with crispy, deliciously salty chips. 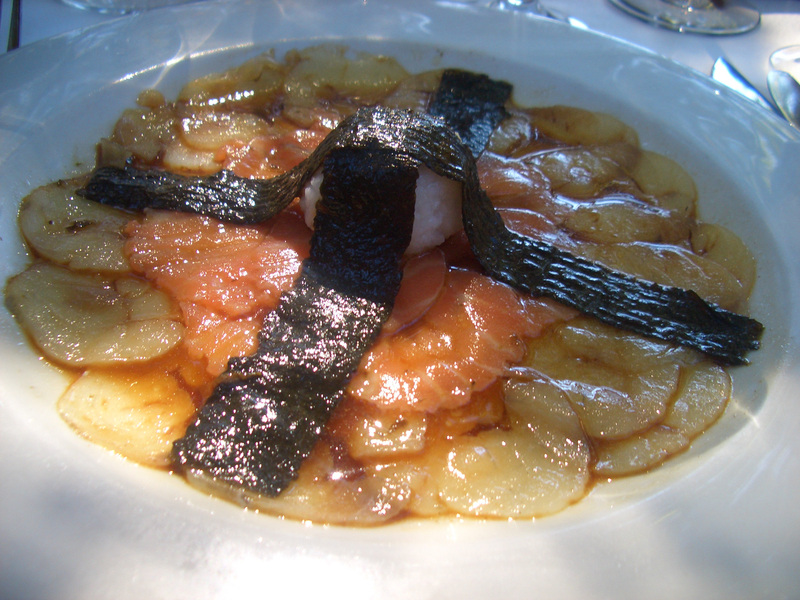 Spanish potatoes are also packed with flavour – this is a dish I would order every time. I’d never visited the Greek Islands before I went on this year’s cruise. I’m now obsessed with going back as I totally fell in love with Santorini. The magical town of Fira is reached by a winding path up a cliff face that you can walk up or climb on the back of a donkey, or there’s a scary (for me with a slight touch of vertigo) cable car ride. Once on top the views are truly spectacular with blue sky and sea and brightly white buildings creating a place of such extraordinary beauty it doesn’t seem real. And as if that’s all not enough, the food is wonderful too. For our lunch on high we tucked into a range of delicacies and voted this amazing lamb dish the winner. 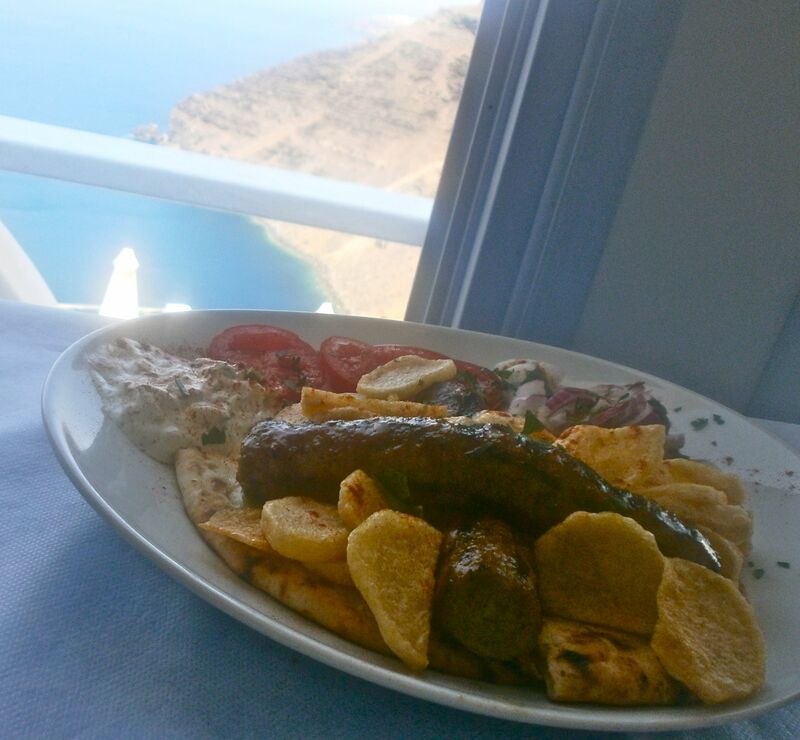 Amazing lamb sausages served with crispy potatoes and a delicious yogurt dip. Juicy and tender with the most incredible flavour. They say food tastes better with a view…and it certainly tasted wonderful. Santorini, I’ll be back! 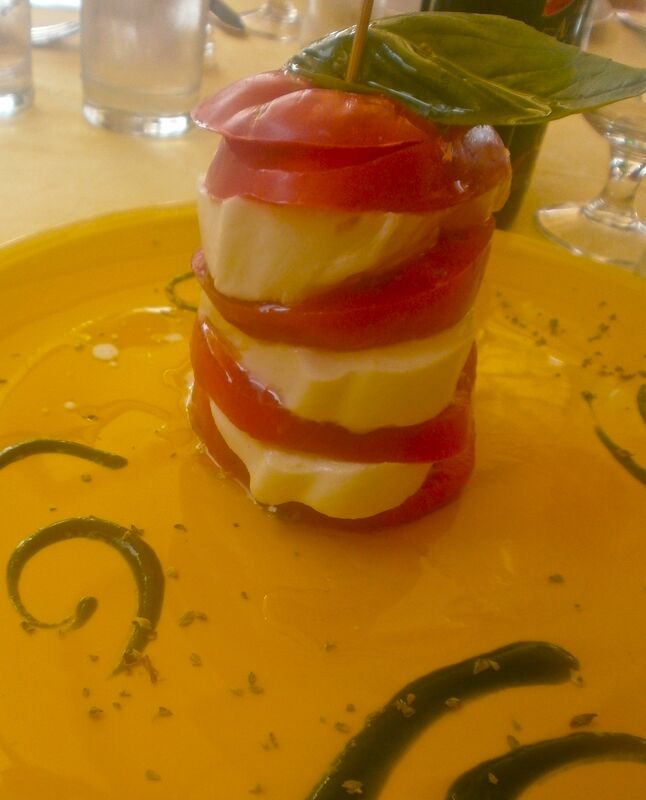 So we started our cruise in Italy and as big fans of the Caprese salad we took it upon ourselves to test out several, so we could state with authority that we’d discovered the best Caprese ever. This beautiful tower of the freshest mozzarella, juiciest tomato and aromatic basil was swerved up with a drizzle of olive oil and swirls of pesto. Tomatoes in Italy taste like how I imagine sunshine would taste and this combination of perfect ingredients and different textures is simply irresistible. The Sicilian gem of Taormina is perched high on a hill with sweeping views over two stunning bays and majestic Mount Etna in the distance. The medieval town takes your breath away it’s so beautiful, and with its upmarket shops, abundant coffee shops and wide range of quality restaurants it’s a real paradise.We settled in to a restaurant with the most incredible view over bouganvillias and other tropical blooms towards the sea, excited to try the Sicilian food and wine. My main course was delectable. 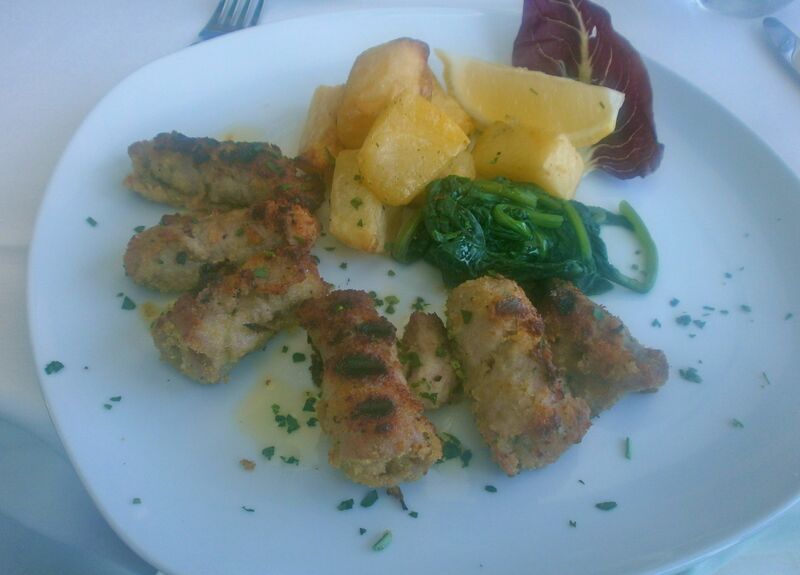 Thin slices of veal rolled around the delicious combo of parmesan, pine nuts and olive oil and fried. This is a dish I am going to have to create. Sicily produces such a wide range of amazing ingredients it’s no wonder their food is so spectacular. Oh, and the wine’s delicious, too. 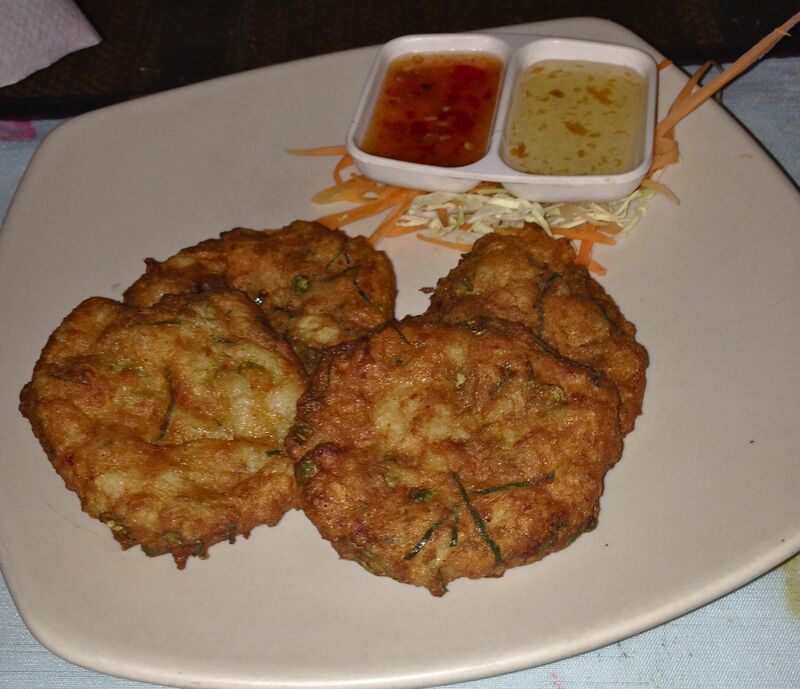 And finally, a dish from my visit to Krabi in Thailand. I’ve visited many parts of Thailand and found the food in Krabi to be more westernised than other places. Having said that, these fishcakes were authentic, and possibly the best I’ve ever had. They were super-light and slightly crispy with the most amazing lemongrass flavours coming through and came with two tasty dips. So how’s that for a bit of a feasting journey around the world? You can read more about all these dishes, restaurants and destinations under the Travel section of my blog. What’s your favourite holiday dish of the year? Do you have any that beat this? Do let me know.